Michelle Obama recently told a group of college students that unpaid internships are worth the financial struggle – a bold claim, considering that the average graduate now departs school with more than US$ 35,000 of debt. The First Lady's opinion is also hardly the last word on the subject. On the other end of the spectrum, plenty of people are advising students to avoid unpaid internships at all costs, citing stories of interns fetching coffee, running menial errands, even scrubbing the floor with a toothbrush. Unfortunately, plenty of bad internships do exist, but the reason they’re bad has nothing to do with their compensation. Too many company managers jump headfirst into creating internships without first devising a plan. They neglect to determine what the internship will entail, what work they’ll assign to the interns and what they themselves hope those young folks will gain from the experience. As a result, they have no idea what to do with their interns from day one. That's how interns end up brewing that coffee, alphabetizing those magazines in the lobby or performing those manual tasks, none of which relate to their future careers at all. Nor are the interns the only ones suffering a bad experience. Because, bad internships waste everyone’s time and provide no value to either party. Worse, they can give your business a negative reputation. Paid or unpaid, every internship should leave all parties feeling good about the arrangement. Interns should be challenged to learn on the job and made to feel comfortable in the workplace. They also should understand that they are the drivers of their own experiences. If they’re feeling bored or overwhelmed, they should be empowered to speak up and voice their opinion, just as an actual employee would. My company has had a paid internship program for years and it keeps getting better and better because we are always consciously learning and adjusting. We do post-internship surveys and hold formal exit interviews to gain valuable knowledge on how to best utilize our young workers. We also have an “Intern Bible” in which outgoing interns write not only processes and protocol, but also advice for the next intern group. Our experiences have shown that the best way to kick off a new internship is with a one-week training process, helping to make our young employees more comfortable in the office. Basically, we set them up for success as we would any new employee (notice the trend? ), and here we use three tips that make each internship mutually beneficial. 1. Offer a variety of learning opportunities. Though the job market is steadily improving, millennials still face an uphill battle when it comes to finding employment: Many of today’s entry-level job postings, for instance, state a requirement of two years' working experience for candidates. This is why internships are so invaluable, but only if they actually offer real-life experience. Memorizing how everyone on the floor takes his or her coffee is not a learning opportunity; giving interns an inside glimpse at how an industry operates is. Have your interns work across multiple departments to expose them to multiple roles and perspectives. Our interns are involved with everything from account strategy to social media, and we also make sure they sit in on plenty of meetings so they can hear the discussions that take place behind closed doors. Eighty percent of CEOs have had mentors at some point in their lives, for good reason. For an intern who's fresh on the job, nothing beats having a designated person to (happily) answer questions and provide feedback. 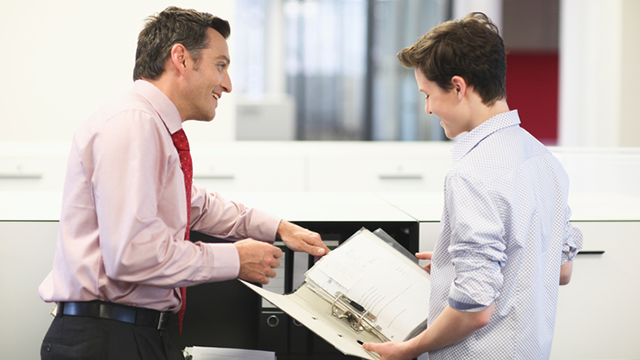 The mentor should be someone who works in the role closest to the intern’s primary interest, and he or she should be enthusiastic about serving as the teacher and lending guidance to a young professional. However, the mentor’s advice should span beyond the ABC’s of your industry. This person should also share wisdom about life in general and help the intern navigate the transition from the college campus to the working world. Then, after the internship ends, the mentor should check in periodically and offer to serve as a professional reference. If you create an internship program with the intention of finding your next CEO, you’re setting yourself up for disappointment. View this as an opportunity to give back to the community and introduce an up-and-comer to professional contacts who can help him or her down the road. Considering the whopping 85 percent of employees who say they found their current jobs through networking, it has never been more important for young professionals to amass a Rolodex of professional contacts. We recently had an intern who worked with us for about eight months, and nothing was more rewarding than knowing we helped her land her first real job. By connecting her to people we knew and helping her hone her job-seeking approach, we didn’t just give her a leg up in the world; we sent a positive ambassador of our brand out into the market. When approached the right way, internships can benefit everyone involved. And those student loans won’t pay themselves, so compensate your interns if you can. But whatever you do, ditch the coffee runs and create a plan that makes interning for your company a meaningful and productive experience.